Way back when, as those first Yosemite tourists braved the rigors of stagecoach transport -- the dust, the rocks, the robbers, etc. 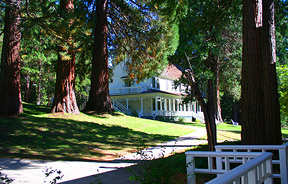 -- at least there was a comfortable hotel waiting for them along Wawona Road. 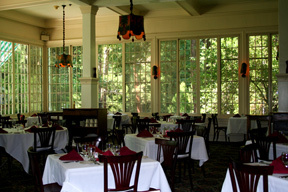 Indian tribes referred to the area as pallahchun, or "a good place to stop". With a nearby river and plenty of game to hunt, it's no wonder this hotel was the first to be built in Yosemite. 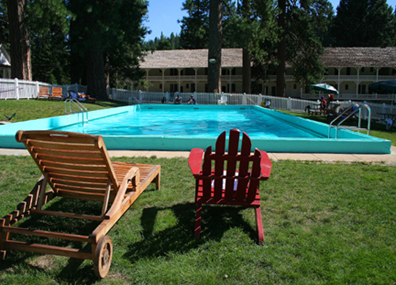 Most people have heard of the four-star Ahwahnee, located in the valley. There, the rich and pampered pay top dollar to enjoy a few spoonfuls of chocolate moose, then retire to one of 99 tiny bedrooms crammed into a cleverly disguised steel and concrete fortress. For my money, I'll take the Wawona Hotel, with its quaint wooden guest houses and cottages, the old-style pool and no rockslide worries to speak of. In the off-season, you can even score a room for $79, although you might be sharing a bath down the hall with your neighbor, just like they did in the old days. Not long ago I researched a screenplay about two Victorian women, Annie Adams Fields and Sarah Orne Jewett, who made the rounds of the Boston literary scene in the late 19th century. The script I subsequently wrote is sort of a sequel to Little Women, and the true-life adventure made me yearn for a chance to go back and live during that time period. Now as I meandered through the hotel proper and checked out the furniture and dining area, it was apparent that I'd gotten my wish. Unlike those sequoias up the road, capturing the spirit of this place required no technical maneuvering. 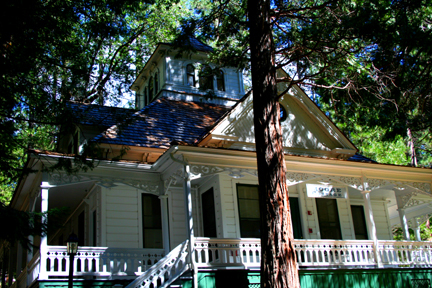 At the Wawona you just hold up your camera and push the button. Then voila! -- there on your LCD are incredible compositions of light and color. The architecture, the gardens, the meadows and the exquisite calm of this hardly known park location effortlessly bedazzle the unsuspecting visitor. Too bad the park concessionaire that runs the hotel overlooks the obvious in its marketing literature. The national historic landmark is billed as a place to play golf, of all things, owing to the nine-hole, par-35 course built back in 1918. (It's all organic, apparently, and irrigated with gray water.) 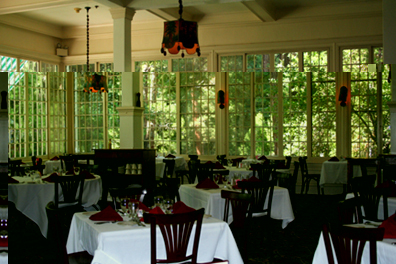 Boy, somebody definitely needs to work on their swing back at corporate headquarters, because the Wawona is like a Merchant-Ivory film come to life. 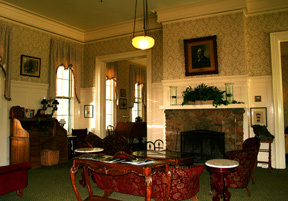 The photo on the left below was taken outside the back of the hotel lobby. To the right is a picture I snapped from the porch of the Thomas Hill Gallery, which is next door to the hotel. Hill was the famous artist who painted Yosemite landscapes - in fact, the Georgia O'Keefe of national parks. And his gallery is the oldest in the country still standing in its original location. Edie and I took our time pouring over every square inch of this treasure trove of visuals. The gallery houses an assortment of Hill paintings (as graphic reproductions) and a souvenir shop run by the nonprofit Yosemite Association. Edie also picked up a cool park service brochure that lists other eclectic galleries and historic landmarks throughout the country. It's well worth a peak. 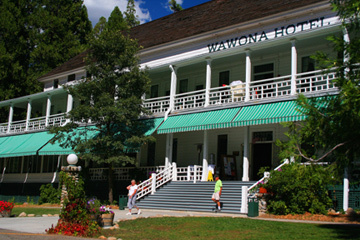 Returning to the subject of film, the movie that the Wawona Hoel makes me think of is not Room with a View or Howard's End, but a lesser known feature called Somewhere in Time. In it, the late Christopher Reeves plays a successful playwright who's confronted at a party by an elderly woman taking her last breaths on earth. She hands him a note with her name on it and says "Come back to me." Eventually, Reeves figures out that he'd somehow met her nearly a hundred years earlier. Bent on seeing her again, he goes into a trance and travels back in time to a particular hotel. There he meets and falls in love with the deceased party crasher while she was still in her prime. 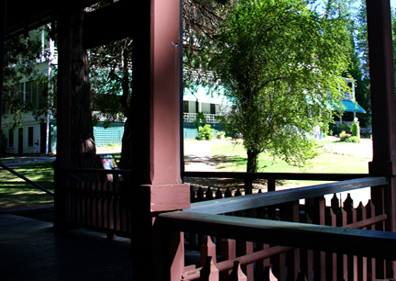 As I sat on that gallery porch, I recalled all the emotions that film conjured up in me. Here in Yosemite, of all unlikely spots, I was getting my Victorian fix.